F. M. Alexander developed and taught the technique which carries his name from 1890 until 1955. He taught in Australia, London and the United States of America. At first he gave only individual lessons. People who wanted to learn to teach the work themselves did so by becoming assistants and learning through apprenticeship. Then, in 1931, the first formal teacher training course was established where a whole group of students could study the work together. At the time of Alexander’s death in 1955 there were only about 20 teachers in the whole world. In 1958, they formed the first professional society: the Society of Teachers of the Alexander Technique (STAT). After Alexander’s death the work continued both through private lessons and the training of new teachers. The dedication and personal skill of many people, and in particular Walter and Dilys Carrington, Marjory and Wilfred Barlow, Patrick Macdonald and Marjory Barstow, ensured that the technique was not lost. It is largely thanks to them that the practical skills have been passed on to new generations and spread across Europe, the United States and the rest of the world. Today the Alexander Technique is indeed taught worldwide. There are over 4000 teachers with professional societies and teacher training courses in 18 countries. Over the past sixty years, a huge quantity of information has been published on the Technique: books, videos, DVDs and CDs; some good and some bad. Although leading scientists have found the technique very valuable there has not been much research on the subject. In general, teachers focus on studying and teaching the practical work and how it can be applied in specific fields (sport, performing arts, pregnancy, neuro-muscular problems …) rather than seeking to scientifically prove its effectiveness. In 1973, Nikolaas Tinbergen devoted half of his acceptance speech for the Nobel Prize in Physiology and Medicine to an enthusiastic description of the Alexander Technique. In 1988, the first International Congress of the Alexander Technique was held in Brighton in the UK. Since then, there have been congresses held in different countries every four years. A large scale study assessing the effectiveness of the Alexander Technique for people with chronic low back pain was published in the British Medical Journal in 2008. This publication has stimulated interest within the scientific community. 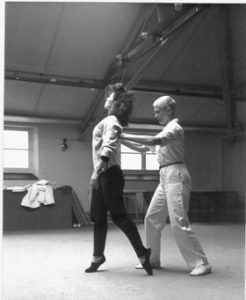 The Alexander Technique was introduced to Belgium at the end of the 1970s by Elizabeth Langford and Paul Collins. Both were trained by the Carringtons at the Constructive Teaching Centre, a very influential school in London. The two teacher training courses currently running in Belgium are directed by teachers trained by Elizabeth Langford. The photo at the top of this page is of Walter Carrington, above on the right is Eliane Lefebvre, one of the first generation of Belgian teachers and here on the left, Elizabeth Langford.